Skin is comprised of two main layers: epidermis and dermis. Cornified layer (stratum corneum) – the outermost skin layer, prevents the entry of foreign substances and the loss of fluid from the body. Granulous layer (stratum granulosum) – lies under the cornified layer, produces proteins and lipids essential for maintenance of the cornified layer. Spinous layer (stratum spinosum) – lies under the granulous layer, contains keratinocytes which differentiate into granulous layer cells. 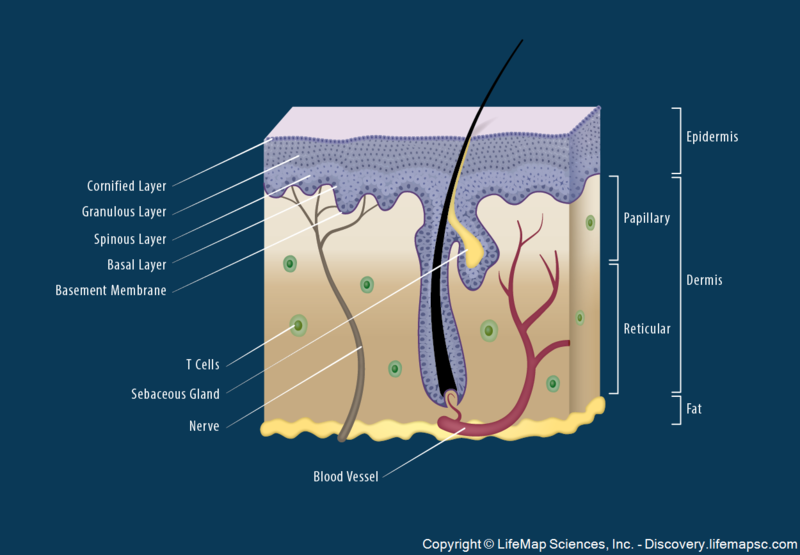 Basal layer (stratum basale) – the deepest layer of the epidermis, contains dividing basal cells and serves a source for constant regeneration of epidermis. Papillary dermis – the upper dermis layer that borders with the epidermis, consists of loosely arranged connective tissue. The papillary dermis contains the terminal network of capillaries that supply blood to the overlying epidermis. Reticular dermis – underlies the papillary dermis, consists of dense connective tissue. The reticular dermis contains hair follicles, nerves, blood vessels and immune cells.